Irtiqa: Movie Interlude: "Agora" - a prequel to "Contact"? 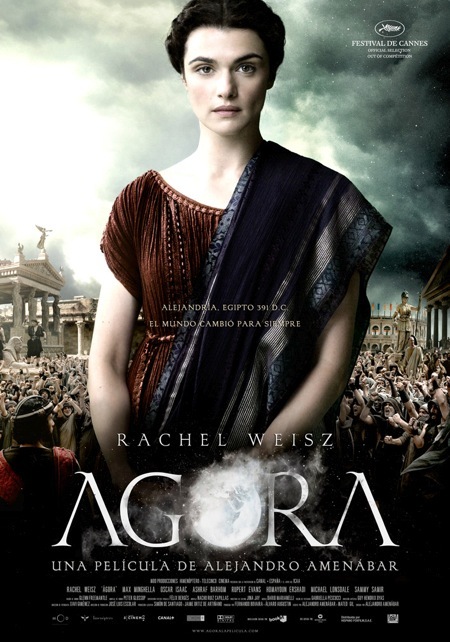 Agora, the movie about the 4th century philosopher/mathematician/astronomer Hypatia and the burning of the Library of Alexandria, never came to any of the theaters around us. This is a shame, as the movie turned out to be quite good (and I had to watch it on the plane - so please consider the fact that my views about the movie have been shaped by looking a small square behind someone else's reclining seat. It is also now available on DVD - so a second viewing is necessary). My first thought about the movie: It can play as a prequel to the movie Contact. While the setting of the two films is separated by roughly 2000 years, in both cases, the lead character is a scientist, a woman, and an atheist. Both characters are driven by seeking knowledge for the sake of knowledge - and the two movies do a good job of translating their passion on to the screen. But in one film, the character ends up burnt at the stake - and I'm not saying which one. [On a side note, I think both Jodi Foster and Rachel Weisz (Hypatia in Agora) usually pick smart and intelligent films to appear in (and yes, even The Mummy - which basically introduced us to Rachel Weisz)]. But if Hypatia lived today, I can totally see her searching for extra-terrestrial intelligence. Agora is set in Roman Egypt and depicts the story of the last days of the great library of Alexandria and the rise of Christianity there. Since I was just returning from Egypt, it was fascinating to see familiar hieroglyphics on the temple columns, and the mention of Egyptian gods in the movie (Alexander and his successors had integrated some of the Egyptian gods into their own mythologies. For example, most of the movie is set at the temple of Serapeum - a temple dedicated to Hellenistic-Egyptian god, Serapis). It is quite clear that the movie is written with the Taliban and the contemporary fundamentalist movements in mind. It is hard not to think of the idiotic destruction of the Buddha statues at Bamiyan by the Taliban. So, yes, the movie does take a clear stance about this issue, but it does portray the appeal of religion in the desire to help others in the face of misery and misfortune. The pagan rulers, in this context, are portrayed as a bit clueless. The movie is shot in an interesting way. There are some wonderful shots of the camera zooming out from individuals rioting to showing Alexandria from space. This is an interesting strategy for a historical and a non science-fiction film. This could have been gimmicky, but I think it worked quite well in extracting us out of the minutiae of human affairs, to the remind of the cosmic perspective. But it did other things as well. One the zoom-outs started from the scene of charging Christians on to the inner gates of Alexandria, and as the camera zoomed out, the charging Christians more and more looked like ants or insects attacking a prey. With a few exceptions, the ruling class of pagans is not presented in much of a flattering light either. In fact some of them are too eager to hold on to the power by pleasing the new religious order. But one thing I really liked about the film is that some of the characters actually change in ways that are complex and perhaps more natural. The movie still contains a number of cliches - but some of the added nuances, more or less, balance out those cliches. But I can almost imagining the balance of power shifting in Alexandria as the way it is depicted in Agora (I said "almost"). And I will also give the movie a pass in terms of some questionable history of science (A minor spoiler: I can totally buy heliocentrism at this time, but I think elliptical orbits and Kepler's second law is a bit of a stretch in the movie, and it bugged me a bit. But I need to think a bit more about the possibility of thinking about elliptical orbits in this context in the 4th century AD). So should you see this movie? Yes, absolutely. This will not be the most amazing movie you have ever seen. However, it is rare that we get movies where the lead character is driven by curiosity and wonder. I would say the same about Contact. The similarities with Contact may not be incidental. Agora is directed by Alejandro Amenabar. After finishing his highly acclaimed film, The Sea Inside, he was taking a break in Malta. While there he got fascinated by the sight of the Milky Way and wanted to do his next movie related to astronomy. And guess what. While doing his research, he ran into Sagan's Cosmos, where Sagan really makes Hypatia as his heroin of the series. In fact, in the first and the last episode, Sagan wanders around the halls of the great Library of Alexandria (created as a model) wondering about the treasures it once held there. If you watch Cosmos, it is hard to ignore Hypatia. Therefore, it is no surprise that Amenabar's Agora also retains a sense of wonder about the universe. Here is the trailer of Agora, followed by Sagan's discussion of the destruction of the Library of Alexandria. And here is a bit of Cosmos on Hypatia and the Library of Alexandria. And fantastic that he links the decline to the failure to speak up against social injustices, such as slavery. Thanks for the recommendation. I found Agora on Netflix & added it to my queue. A very thoughtful review. I saw Agora when it first came out in NYC and loved Weisz' performance as Hypatia. You really must see it on something bigger than an airplane screen! I thought the film was beautifully shot, a bit uneven, but a wonderful exploration of modern themes in a historical context.For more about the historical Hypatia, I recommend a very readable biography Hypatia of Alexandria by Maria Dzielska (Harvard University Press, 1995). I also have a series of posts on the historical events and characters in the film at my blog - not a movie review, just a "reel vs. real" discussion. Thanks faithljustice. This is a fantastic resource and I will post it on the blog. We need more sites that deal with history in films (there are some, but they are not very consistent. It would be great to have a good resource website). Hmm... I must watch Agora now as Contact is one of my all time fav. I was wondering where else I read abt it (Agora)... I remember now, it was Atheist Movies (http://atheistmovies.blogspot.com) with link to download the movie.